Brass banding started in the early 1800s, after improvements in machinery allowed for the construction of new instruments using pistons (valves) and slides. By around 1900 there were a few thousand bands in the villages/towns around the country and many thousands of players. As time went on, many bands merged or ceased to exist as world wars, changing working patterns, local changes to industry, new forms of entertainment appeared and transport between towns became easier. There are now around 500 brass bands in the UK. 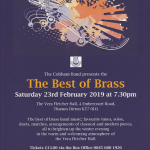 The Cobham & District Band (now The Cobham Band) was formed in 1887 and at that time had strong connections with the Ancient Order of Foresters. It started as a drum and fife band but the earliest records show it contained both brass and woodwind players. Excerpts from the parish magazine of the late 19th Century show that the band took a lively part in village life and was at that time a marching band. At the beginning of both world wars the band was temporarily disbanded and reformed in peace time. In the 1950s the band came under the auspices of the St John’s Ambulance Brigade. In 1959 it became an independent organization again and ceased being a marching band. In 1970 it became an ‘All Brass’ band with the death of the last surviving reed player, William Haynes. 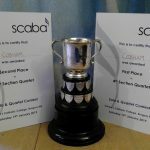 The band now has a loyal membership and plays at concerts, fetes, competitions and other events throughout the year. The band has performed at a number of prestigious venues including Westminster Abbey Gardens, several Royal Parks and The Yehudi Menuhin School in Cobham. 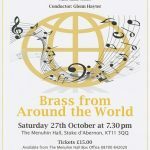 It has also played alongside top brass banding names such as Ian Porthouse (Conductor of The 2010 British Open Champions, Tredegar Town Band), Steven Sykes (Radio 2 Young Brass Soloist 2009) and with Norwegian band Nidaros Brass Band as part of their UK tour.